It took American colonists a century and a half to expand as far west as the Appalachian Mountains, a few hundred miles from the Atlantic coast. It took another fifty years to push the frontier to the Mississippi River. Seeking cheap land and inspired by the notion that Americans had a “manifest destiny” to stretch across the continent, pioneers by 1850 pushed the edge of settlement to Texas, the Southwest, and the Pacific Northwest. 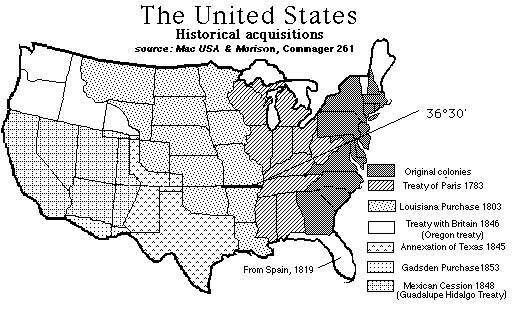 The U.S. had expanded and acquired the vast territory that stretched from sea to shining sea. From the signing of the Declaration of Independence on July 4, 1776, the fledgling 13 Colonies had expanded westward and from sea to shining sea in merely 72 years, and by doing so it had henceforth removed the presence of the world powers of England, Spain, and France. But it all began with President Thomas Jefferson's vision and the Louisiana Purchase Agreement in 1803. The following list of studies includes the numerous doctrines, treaties, purchases, agreements, acquisitions, acts, policies, compromises, bills, laws, maps, events, proclamations and wars relating to the territorial expansion of the United States. From the first shots fired at Lexington to the signing of the Declaration of Independence to the negotiations for the Louisiana Purchase, Ellis guides us through the decisive issues of the nation’s founding, and illuminates the emerging philosophies, shifting alliances, and personal and political foibles of our now iconic leaders—Washington, Jefferson, Madison, Hamilton, and Adams. He casts an incisive eye on the founders’ achievements, arguing that the American Revolution was, paradoxically, an evolution—and that part of what made it so extraordinary was the gradual pace at which it occurred. He shows us why the fact that it was brought about by a group, rather than by a single individual, distinguished it from the bloodier revolutions of other countries, and ultimately played a key role in determining its success. He explains how the idea of a strong federal government, championed by Washington, was eventually embraced by the American people, the majority of whom had to be won over, as they feared an absolute power reminiscent of the British Empire. And he details the emergence of the two-party system—then a political novelty—which today stands as the founders’ most enduring legacy. But Ellis is equally incisive about their failures, and he makes clear how their inability to abolish slavery and to reach a just settlement with the Native Americans has played an equally important role in shaping our national character. He demonstrates how these misjudgments, now so abundantly evident, were not necessarily inevitable. We learn of the negotiations between Henry Knox and Alexander McGillivray, the most talented Indian statesman of his time, which began in good faith and ended in disaster. And we come to understand how a political solution to slavery required the kind of robust federal power that the Jeffersonians viewed as a betrayal of their most deeply held principles. With eloquence and insight, Ellis strips the mythic veneer of the revolutionary generation to reveal men both human and inspired, possessed of both brilliance and blindness. American Creation is a book that delineates an era of flawed greatness, at a time when understanding our origins is more important than ever. About the Author: Joseph J. Ellis received the Pulitzer Prize for Founding Brothers and the National Book Award for his portrait of Thomas Jefferson, American Sphinx. He is the Ford Foundation Professor of History at Mount Holyoke College. He lives in Amherst, Massachusetts, with his wife, Ellen, and their youngest son, Alex. Recommended Viewing: 500 Nations (372 minutes). Description: 500 Nations is an eight-part documentary (more than 6 hours and that's not including its interactive CD-ROM filled with extra features) that explores the history of the indigenous peoples of North and Central America, from pre-Colombian times through the period of European contact and colonization, to the end of the 19th century and the subjugation of the Plains Indians of North America. 500 Nations utilizes historical texts, eyewitness accounts, pictorial sources and computer graphic reconstructions to explore the magnificent civilizations which flourished prior to contact with Western civilization, and to tell the dramatic and tragic story of the Native American nations' desperate attempts to retain their way of life against overwhelming odds.